Review: From the get-go, this printer caused me nothing but problems. I had printed about 10 sheets when the print quality fell through the floor. Ran through the print head cleaning process numerous times, per the manual, with only marginal improvement. After burning through several ink cartridges trying to clean the sorry printer, God-forbid, I bought non-OEM ink cartridges. Eventually, the printer displayed the printer equivalent of the "Blue Screen of Death" Machine Error, and I was directed to take the printer to the Authorized Repair Center. Three months and many phone calls later, they finally told me that the print head was shot, and that it was going to cost 25% more to repair the printer than I paid for it. Additionally, it wasn't going to be covered by the warranty because I used non-OEM ink! I've used non-OEM ink for my Epson and HP for years with NO problems, and now this is the cause of my problems with the Brother?? I don't think so. I'll never own another Brother product again. Please contact me if you wish, for details. AVOID BROTHER LIKE THE PLAGUE!!! Review: Have had nothing but outstanding luck with Brother products. This machine no exception. Worked great right out of the box - no problems at all. Print and copy quality are both excellent and the speed is as advertised. Installation of the ink cartridges was incredibly easy - the easiest I have installed. I even bought one for my dad. Highly recommended. Review: I am a systems' engineer...TRUST ME WHEN I TELL YOU BUY HP MFC DEVICE AND SPEND THE EXTRA $ if you can afford it on a 3 year exchange warranty. Brother truly makes inferior mfc devices. Don't fall prey to the B.S. Ad slicks they spend more money on hype than invest in producing a high quality product. Review: I bought this printer about a year ago and have been reasonably happy with it. I use it in a home business where i do print alot so it gets alot of use. I hate it that if you run out of one color it wont print black and white until you change the color ink. It prints pretty fast but the ink is really light sometimes. The tray on it broke right away with minimal use also. Review: I bought this printer in April 2003. For the price, the printer packed a lot of features. I've never purchased a Brother printer so I figured I'd give it a try. Well, after getting the printer, the quality of print was so so. But for all the features and the price, well, couldn't complain, until about 13 months later (1 month after warranty expired.) Got an error, machine error 22. Called Brother and they said it needed service and they wouldn't cover it since it's out of warranty. Reading other reviews on internet now, many people have gotten this error and the cost to fix the printer is almost as much as just buying a new printer. Last Brother printer for me. Going back to HP or Epson. Summary: Lots of Features, but doesn't last. Review: I bought this unit in the summer of '03 as a replacement for another Brother machine that seemed to be failing. By the time I received the MFC-5200, the other machine was OK again so I'm only now installing the new one -- or trying to. So far it has crashed my Windows XP Pro operating system twice. After the first crash, I went to the Brothers web site, looked around a bit, and found that this crashing problem was a known issue -- so much so that they have a download on-site to UNINSTALL the drivers that the installation CD automatically installed. (And BTW, according to their web site, this issue was KNOWN in January '03, 6 months before I bought mine -- yet there was NOTHING in the package to let me know that if I used the installation CD in the package, it would crash my system.) Anyway, I downloaded the patch to uninstall the drivers, then went back to Brother's web site to download the correct XP driver. What the instructions told me was supposed to happen, didn't happen (and yes, I followed their instructions to the letter). Instead, it crashed my system again. 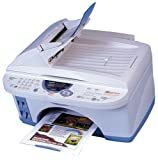 I have completely erased the Brother files off my computer and have disconnected the unit pending a phone call to Brother tomorrow -- so right now I have a relatively expensive stand-alone color copier, since I can't use the printer or scanner or faxing options. I can't really say how the product will work since the *&^@($ thing keeps crashing my computer. I'll update this review if the Brother techs can get the thing started. Review: I had a really hard time installing the ink cartridges in this printer, I called the 800 number that Brother provided and was told this is a very common problem...defective machines! I bought this printer after careful research (as I assume that you are doing)...but all I can say is you're wasting you time and money in buying this printer. Review: I loved this printer, until it was out of warranty and the print head went out. Quoted $200 to replace a Brother print head. Told by the tech that Brother is famous for this.